I’ve long been marginally aware of the violations and injustices perpetrated by industries operating in majority world countries. After receiving Mr. Julian’s email about Bill C-331 I did some research and found out even more about the impact of Canadian mining companies internationally, particularly in Latin America. Between 50% and 70% of mining activity in Latin America involves Canadian companies. The increase in Canadian mining in Latin America is partially due to the last Government’s international development policy. Rather than prioritizing sustainable development in developing countries, this policy was prioritized the achievement of Canada’s prosperity and security. This happened to such an extent that certain development projects were conditioned on the benefits to Canadian mining companies’ projects in that country. The consequence of this prioritization was that Canadian development funding basically became a tool for mining investment promotion in developing countries. While there are still issues with the Government of Canada’s foreign assistance funding, the new government has refocused Canada’s international assistance away from blindly supporting Canadian mining interests and back on helping the poorest and most vulnerable people. Despite this, Canadian mining companies still contribute heavily to the violations of human rights that may communities have faced as a result of the expansion of largescale mining projects. A report released in 2014 implicates Canadian mining companies’ in a variety of injustices, including: Serious negative environmental impact, forced displacement of people and communities, community divisions and the breakdown of social fabric, the criminalization of social protest, adverse local economic impacts, violent deaths and serious injuries to mineworkers and opponents of projects, adverse health consequences, and fraudulent acquisition of property. That is quite a list. To make matters worse, generally perpetrators enjoy impunity while victims lack access to justice at any level. Bill C-331 has the potential to change this. It would allow Canadian courts to hear and decide claims for violations of international law that occur outside of Canada. Specifically, the legislation would allow non-citizens – the victims of these injustices perpetrated by Canadian mining companies – to access to the Canadian courts for gross violations of basic human, environmental and labour rights, even when they are committed outside of Canada. 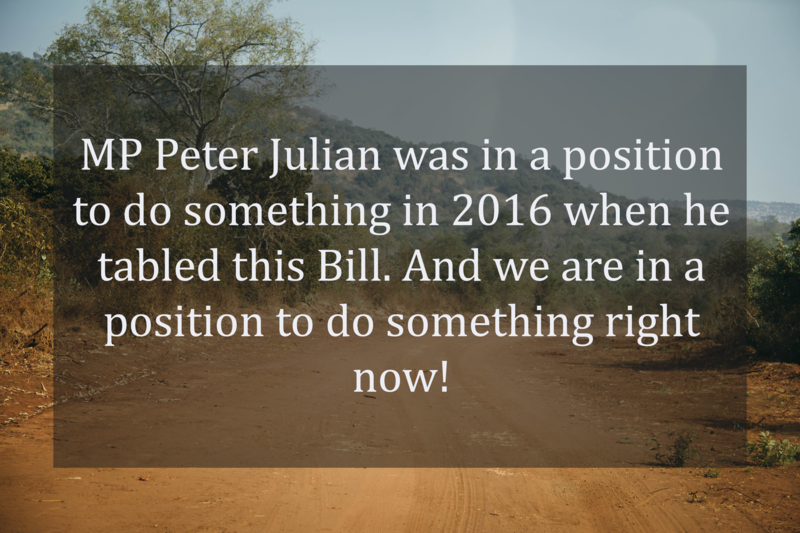 MP Peter Julian was in a position to do something in 2016 when he tabled this Bill. Parliament will be in a position to do something when it goes for its second reading. And we are in a position to do something right now! Hold public community meetings or events: Working with your local organizations, help organize public forums with panel discussions on issues related to corporate social responsibility and the need for legislative tools like Bill C-331, include a question-and-answer session. Write a letter of support: You and/or your organization are invited to write a letter in support of Bill C-331 and send it to Peter Julian’s office (Postage free – Room 629-C, Centre Block, House of Commons, Ottawa K1A 0A6) and to your local MP. 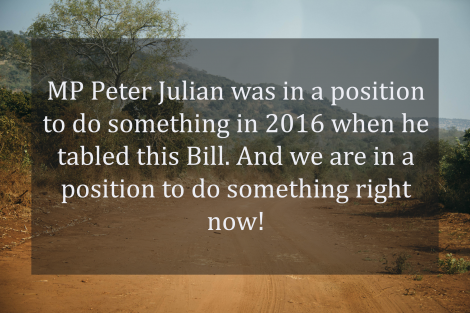 To help keep up the pressure on the Conservative government on issues and concerns you have regarding Human rights and environmental violations and to help us advance our campaign, please download Peter Julian’s latest petition for Bill C-331. Then get the support of your friends, neighbours, people you work with and get them to sign the petition. When you have as many signatures as you can get, mail the petitions (postage free) to Peter’s Parliamentary Office in Ottawa. Peter would then table your petitions in the House of Commons.